open the relevant files in your IDE. A Bamboo administrator can make links to individual source-code files available by connecting the plan to the source repository, as described below. Navigate to the repository configuration for a linked repository, plan or job. See Linking to source code repositories . Click on a repository name, and then click Advanced Options. Choose Web Repository > Fisheye. Specify the Fisheye URL, Repository Name and Repository Path. 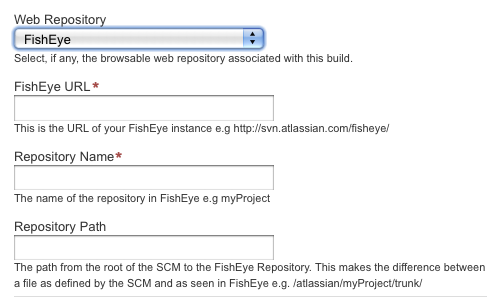 If links to Fisheye are broken in Bamboo builds, make sure that the Repository Path configured in Bamboo matches the Repository Location (under 'SCM Details' ) in Fisheye, for the specific repository.